This is not “a word from our sponsor” and I’m not even getting any free yogurt out of it (darn! ), but rather I found these at the grocery store and was really happy. As a sweets fanatic who happens to be health conscious, I’m always on the lookout for good low calorie/high protein sources to help balance out the sugar. Thanks to Nicole at Baking Bites, who turned me on to it last year, I’ve grown quite fond of Greek yogurt which has more than twice the protein of regular. I usually buy different brands because I like trying them all, and now Yoplait has one too. These were on sale at H.E.B. grocery store for $1.00 a carton and each carton has 130 calories, 0 grams of fat and 13 grams protein. The Yoplait is pretty good. I bought strawberry and blueberry and tried the strawberry flavor yesterday. It doesn’t have any jelly or chopped fruit in it, which makes it perfect for the addition of fresh (though I didn’t have any at the time), It’s not too sweet, has a smooth texture and is not so that kids wouldn’t eat it. I think they’d like it better with fresh fruit, though. It would be great in smoothies. Anyhow, I thought I’d tell you about it. Sorry if this sounds like ad ad, though for a while I did see some Yoplait ads go by on one my banners. Maybe they’ll run one for the Greek yogurt, but I couldn’t find a reference to it on their website so maybe it’s in a test market stage. Also, I was looking around for other references to this on other blogs and someone said the Honey flavored Yoplait was incredible. Thanks for the recommendation! When I posted this review, there weren’t a lot of brands of Greek yogurt to choose from. Yoplait was one of the first mainstream brands to introduce a high protein variety. Now there are all sorts of great varieties and brands. I’ve reviewed others since then. In the meantime, Yoplait has made changes to their product trying to meet consumer demand. I do like Fage and Voskos. I haven’t seen 3 Greek Gods at my local grocery store. Oh my goodness I hate Yoplait “Greek” yogurt. I am an extremely loyal customer to a brand called “3 Greek Gods” and especially partial to the honey flavor. Yoplait is terrible I stopped eating it years ago. It just seems a little too fake to me. Read the ingredients, the less the better. If you don’t know what something is doing in the ingredients list, it probably shouldn’t be there in the first place. When did food take such a wrong turn from being food? Now some things are almost unrecognizable. But anyways I’m rambling. The deal is, get a REAL greek yogurt, not Yoplait. (Despite what many say though, Yoplait DOES have live and active cultures, it just isn’t very visible on the packaging.) My favorites are 3 Greek Gods and Fage. They seem to be so much more real in flavor and quality ingredients. 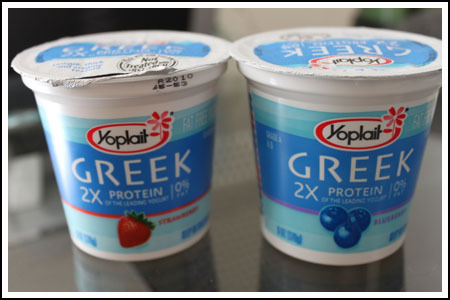 Definitely give them a whirl and then try Yoplait’s “greek” and tell me if you can tell a difference. I can assure you, you will. Love Greek yogurt! but I have a new favorite, LIBERTE mediterranee. has bought this brand. I found this product at H.E.B. in Midland, Texas. yogurt I’ve found. Even thicker and creamier than Alta Deena. Sure are some funny ingredients in the Yoplait Greek yogurt. I agree with other posts, you cannot really call this greek yogurt. I am not even sure if this Yoplait Greek yogurt has any live cultures in it at all. My favorite Greek yogurt is Fage. Greek Gods isn’t bad and a little cheaper. I haven’t tried Chobani or Oikos yet. Greek yogurt is absolutely delicious when it is made properly by straining off some of the liquid from pure yogurt. The result is a wonderful creamy yogurt that is thick and rich and absolutely delicious. Chobani, Fage, or homemade Greek yogurt all have these qualities. I am eating Yoplait greek right now and it is nasty. It lacks the wonderful pure qualities that make yogurt so good, and it seems to miss the point of Greek yogurt altogether. I, too, tried the Greek style yogurt and was disappointed with it. I have had other brands of Greek style yogurt and was pleased with it, but found yours pasty and not very good tasting. Since I bought five containers (to take advantage of the coupon in Sunday’s paper), I will use them mixed with other foods, but am not a “happy camper”. I was very disppointed with Yoplait’s Greek style yogurt. I tried the honey vanilla and could not detect much honey or vanilla flavor. It also had a very pickley taste to it. I expected more from Yoplait than this. Heidi is correct that the Yoplait version is not true Greek Yogurt, its simply regular yogurt that has been thickened to the consistency of greek yogurt. If you look at the label you can see the second ingredient is actually “Milk Protein Concentrate” which is how they meet nutritional statements for protein in the level of greek yogurt. This is also why it has that chalky texture. 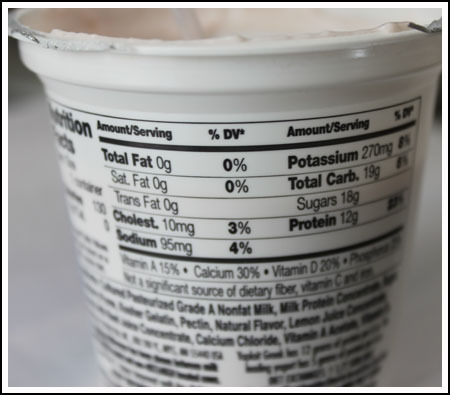 Compare that to the label of something like Oikos, Fage, or Dannon Greek yogurts and you wont find the Milk Protein concentrate, or the Gelatin. To be fair Yoplait is more like Greek Style yogurt… since they are clearly not straining anything. Heidi – I share your suspicion about the gelatin. But, Nick is right – I’m sitting her right now having just finished a container of the Plain Yoplait Greek – it has in tiny print on the back and in a more prominent label on the side that it contains live & active cultures. I really like the texture though, so I might be okay with some more gelatin in my diet! 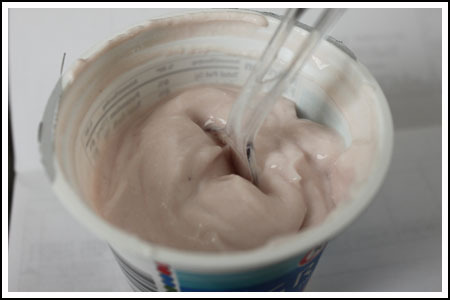 All yogurt has live and active cultures. It must contain them in order to be called yogurt. can’t wait to try it myself! I bought some of this today. I regularly buy Fage in a big tub from Costco. The Yoplait strawberry seemed chalky and kind of mealy in comparison. Compared to a cup of plain nonfat Fage, it has more calories and sugar (due of course to the flavoring). What I also noticed is that this Yoplait doesn’t have any live active cultures – which is part of the point of me eating it. It uses gelatin and pectin to give it the thickness that is present in Greek yogurt from straining. So my suspicion is that it is just regular yogurt thickened up to act like Greek yogurt, and doesn’t even do my digestive system any good! Your “ad” worked – I just bought some 🙂 I bought some other kinds too.. think I got a little carried away! My usual brand of yougurt is Astro, Balkan Style. I believe that is the same as Greek Style yogurt but I’m not sure. Also I’m not sure if Astro is sold in the States. I’ve only seen it here in Canada. Excellent Quality and cheaper than Yoplait. Just wanted to let you know that I tried the Yoplait greek yogurt you suggested. I went to grab the Oikos yogurt at the grocery store and noticed they had the Yoplait right next to it, so I grabbed a plain and blueberry to try. I tasted the plain by itself and thought it was very tangy, almost like sour cream, but I liked the smooth texture. I stirred in some blueberry preserves and it was very good. I think the Yoplait seems to have a smoother texture than some other brands, and even though it struck be as being very tangy at first, I enjoyed the flavor especially with the preserves mixed in. I haven’t tried the blueberry flavor yet, but I’m glad I tried the plain. Thanks again for the tip! I also like trying all the different brands of Greek yogurt. Seems like every company needs to have one these days. The first one I remember seeing on the market is still my fave–Fage! I really like the 0%, and the 2% is incredibly creamy and rich-tasting. I mostly stick to plain or honey. I liked Oikos (the Stoneyfield Farms one), and I thought the plain Chobani was inedibly chalky, though I didn’t try any of the flavors. Anna, Thanks for the followup about Yoplait using HFCS. I think at one time there original style yogurt did and that is what prompted me to buy it. I will look for their Greek yogurt. Someone else just mentioned Chobani. YUM! Their pineapple flavor is delish! Thanks for the review Anna. It didn’t sound like an ad at all. I really like reviews -it’s how I find new products to look for at the store. I just start eating Greek yogurt 3 weeks ago because of the high protein, low fat, and low carbs. I eat Oikos and also a new? brand up in Minnesota called Chobani. I have not seen Yoplait’s version, but I’ll bet it will be here soon!!! Thanks for letting me know so I can keep my eye out for it!!! I cut up 1/2 a banana and mix it in because the Greek yogurts don’t have much sugar. I have to find some way to use bananas since I’ve taken a break from banana brownies! I always put honey on my greek yoghurt, good to know they make honey flavored. THe flavor is so good in Greek Yoghurt and I’m full for longer on it. Yum! Jennie, I’m never tried honey flavor but I suppose I should. I checked the ingredient label of the Yoplai and didn’t see high fructose corn syrup. It said it was sweetened with sugar and berry puree. I was glad to see you mentioned the honey greek yogurt. It is my absolute favorite!! I am not a fan of yoplait as I beleive they still use high fructose corn syrup in their products, but if you can can find “Faje” brand greek yogurt with honey it is TOO DIE FOR. It comes with real honey attached to the container that you mix in. I will warn you, it is loaded with fat, but as a special treat it is worth it. Cool,. I haven’t seen that yet either and will have to look for it! Shannon, I know what you mean about the fruit on the bottom yogurts having a strange flavor. I eat them anyway, though. Louise, I just posted a photo of the nutritional label. It shows 19 carbs. Jennifer, Oikos is what I usually buy as well. Steph and Jalanda, thanks for bringing up the protein issue. I was wondering about that but never bothered to look it up. Rina, I don’t think I’ve ever tried Fage. Chris, most stores seem to carry Oikos these days. I’m not sure how many are selling the new Yoplait. Therese, it says 18 grams for the sugars. How much sugar in this yogurt? I am a die hard fan of Dannon’s Low Carb yogurt. And my daughter who is a Juvenile Diabetic..has to watch her sugars. I hope that it is more reasonably priced than the Oikos brand that I usually buy. Your kudos is promising enough to have me try it. By the way, you are correct: The straining method does help the yogurt maintain more of the nutritive protien as well as give it that lovely consistency and mouth feel. thanks for the heads up — I’ll keep my eye out for it. I really like the trader joe’s brand or better yet make my own. My kids have gotten to the point that they will choose plain yogurt with a spoon full of jam over pre-sweetened yogurt. I wonder why the Greek yogurt has more protein? Is it the straining? When I make my own, I keep the drained whey for use in pancakes and muffins. I like Greek yogurt, too, and I usually buy “Oikos,” but it’s so expensive and there’s not coupons for it very often. I’m glad to hear that yoplait has their own option (hopefully it’ll be available here soon), since they often run coupons. Thanks for the tip! Like you, I enjoy greek yogurt but always buy different brands because I’m not sure which one I really like the most. I’ve found that I don’t usually like the kind that has fruit on the bottom because it always seem to have a funny taste.. almost too sweet (it reminds me of Splenda, even though there is not any in it). I’ll be on the lookout for the Yoplait though, I’m not sure if my grocery store has it.